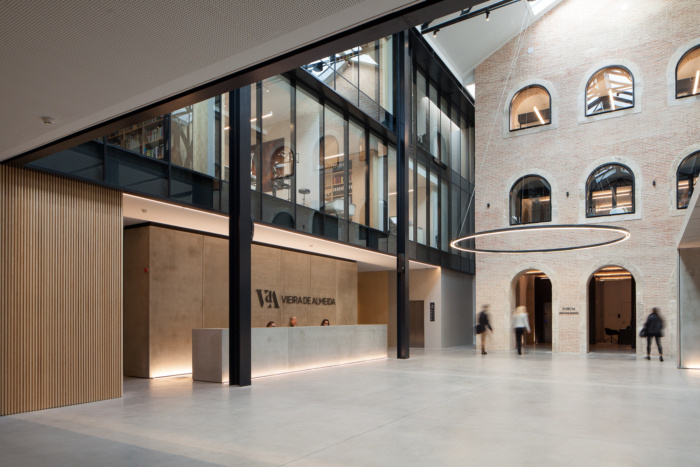 Located in the heart of Lisbon, the Vieira de Almeida offices are comprised of over 100,000 square feet of refurbished warehouse space to accommodate the leading Portuguese law firm's growing success. OPENBOOK Architecture and PMC Arquitectos used the theme of industrial character to design the offices for law firm VdA (Vieira de Almeida & Associados) located in Lisbon, Portugal. Once a car garage in the 1940’s, this old warehouse gave place to VdA – Vieira de Almeida’s new headquarters. This award winning rehabilitation project in Lisbon’s riverside area reinforced the owner’s commitment to the city. Through the recovery of reference elements, it was possible to maintain the memory and the industrial character that marked an era, while at the same time adapting it to the current user’s requirements. The whole central body, of an ‘industrial character’, was kept with the existing vaults preserving the main structure, the metallic elements, the great brick walls and other diverse elements. The use of the geometry of the roof made it possible to create exceptional and unique interior volumetry, as well as allowing for natural light to enter the entire building, allowing work places to be illuminated through light wells created on all floors. By uncovering the rich palette of textures, tonalities and shapes, it became possible to create a space of proximity and collaboration that reflects the client’s own culture. Based on the concept of reshaping the experience of spaces, the building offers three informal meeting spaces, a 140-seat auditorium, a library, an art gallery, 23 meeting rooms, a music studio and a medical office, and also 157 offices for a total of 380 workstations.